The Evanston City Council anguished over the fate of the Harley Clarke Mansion Monday night before ultimately siding with its Preservation Commission to protect the publicly owned property. A referendum in last month’s election found that 80 percent of Evanston voters wanted to save Harley Clarke. The public comments at Monday’s meeting were similarly lopsided. In the end, after three hours, council members who voted to move forward on demolishing the building earlier this year said they had no choice but to protect it. The council vote was unanimous, 9-0, but that failed to mask deep divides among both aldermen and residents. First Ward Alderman Judy Fiske opened debate on the issue by pointing out that the council was considering a motion to “approve an application to appeal,” not the actual appeal itself to the Preservation Commission’s recent 10-0 vote against demolition. She urged her colleagues to “accept this application so we can have this conversation in January” at the next council meeting. 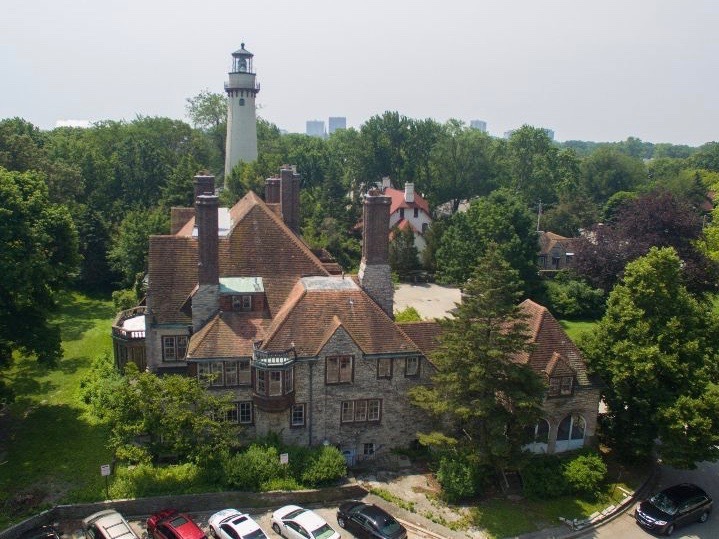 Fiske charged that the commission “didn’t do the homework necessary” in ruling against the demolition proposed and funded by Evanston Lighthouse Dunes. She added that there were plenty of other Tudor Revival and French Eclectic buildings in Evanston for architecture aficionados to enjoy. That didn’t wash with 4th Ward Alderman Donald Wilson. “We should be expected to follow our own rules,” he said, adding that he found no “significant ambiguity” in the commission’s unanimous vote to preserve the mansion. Attorney Anthony Borich of Jenner & Block, representing the Landmarks Illinois preservationist group and Evanston Lakehouse & Gardens, which earlier this year lost a bid to lease the building before the council, had a letter read into the record threatening to file suit if the city moved to overrule its own Preservation Commission. Local resident Brad Weiss echoed that position, emphasizing that the commission vote was “not advisory” but “a final decision” and calling on the council to “uphold” that ruling. After Assistant City Manager Erika Storlie revealed that the city regularly fields offers to revive or repurpose the mansion, on an almost weekly basis, 3rd Ward Alderman Melissa Wynne said it was time to end talk of demolition because it only acted as a deterrent to preserve the building. Wynne pointed out that the commission had found that Harley Clarke “is in remarkably good shape,” and she backed an offer from the Save Harley Clarke community group to contribute $15,000 a year to maintain the building as is until a more permanent plan is adopted. Wynne also cited Evanston’s long-lost Lincoln School as a bad decision for preservationists, adding that it would be hypocritical for the council to move to raze the building and then approve a new Climate Action and Resilience Plan putting Evanston on the path to entirely clean and renewable energy. “At the same meeting we could vote to demolish?” Wynne said. Known as “the people’s mansion,” the building was constructed by architect Richard Powers in 1927 for Harley Clarke, a multimillionaire utilities magnate. The surrounding grounds were designed by Jens Jensen, who’d already built Chicago’s Garfield Park Conservatory. Ownership passed to the city in 1965, and it served for years as home to the Evanston Arts Center before being shuttered in 2015. Many residents have expressed how it’s still a beloved building by those who grew up in Evanston and those who still live there. Some aldermen, however, were bitter about being forced to accept the commission decision. Ninth Ward Alderman Cicely Fleming said the entire extended debate “has shown a lot of ugliness in our city.” Proclaiming herself “in the just-a-building camp,” she said she found it “baffling” that Evanston residents would exert more energy on preserving a building than on the public welfare of their fellow citizens. Second Ward Alderman Peter Braithwaite threw down a challenge against “any threat to run against me” over the issue, even as he signaled he was resigned to preservation. Nonetheless, Rue Simmons threatened to dig in her heels unless pledges were made that no public money would be spent on the mansion. Wynne and Wilson responded that was a separate matter for another time. Rue Simmons was the first alderman called to vote, and after she voted against accepting the appeal the eight others followed in step. Some 71 people signed up to fill the 45 minutes allotted for public comment before the debate ensued, allowed 45 seconds apiece, with most commenting on Harley Clarke, and the vast majority of those in favor of preservation. Several called on their alderman specifically to respect the wishes of voters as expressed in the referendum, which carried every ward with an overwhelming majority. Yet Robert Dalrymple dismissed the referendum, saying it “just kicks the can down the road,” and a handful of others also urged demolition.